Entrapment neuropathy is the technical term for nerve pain that is caused when a nerve is compressed in some way, often by a muscle spasm or inflammation. It also is referred to as a pinched nerve. Common forms of entrapment neuropathy are carpal and cubital syndrome, which affect nerves in the wrists and elbows, causing pain and numbness in the hands. When a nerve is compressed, it often can cause symptoms away from the actual site of the entrapment. For example, pain in the legs and feet can result from entrapment neuropathy in the hip area or in the thighs, because nerves in these areas carry signals to the rest of the leg. Cubital tunnel syndrome involves a compressed nerve in the elbow, but common symptoms occur on the outer fingers and outer edge of the hand. Carpal tunnel syndrome is a compression of a nerve in the wrist, but symptoms also occur on the inner fingers as well as the wrist. In addition to these familiar entrapment neuropathies, other types of entrapment also can occur. Similar to carpal tunnel syndrome, tarsal tunnel syndrome occurs because of entrapment neuropathy of a nerve in the ankle. Symptoms are similar to carpal tunnel syndrome but affect the feet instead of the hands. Sciatica, which causes pain and numbness through the hip, legs and lower back, also can occur as a result of entrapment neuropathy. Pain, loss of strength or sensory changes (paresthesias) in the distribution of the median or ulnar nerves not associated with neck pain. History and physical exam (screen for associated conditions, i.e., diabetes, pregnancy, Rheumatoid Arthritis, Systemic Lupus Erythematosus (SLE). Assessment with provocative tests to include Tinel’s and Phalen’s sign tests of specific nerves. Plain radiographs are not required (unless there was trauma); MRI/CT are not indicated. For Carpal Tunnel Syndrome (CTS) symptoms prescribe a wrist splint (wrist in a neutral position) to wear at night and during the day for aggravating activities (take splint off every 2 hours and move wrist to prevent stiffness). For cubital tunnel syndrome, educate the patient to avoid pressure on elbow. For both, try work simplification techniques using ergonomic principles and activity modification to decrease symptoms. Expect resolution or decreasing symptoms within two to four weeks. Consider confirming the diagnosis with Electromyography/Nerve Conduction Velocity (EMG/NCV), (PM&R or Neuro diagnostics) if symptoms have not resolved within 6 weeks or if there has been no response to treatment. Continue NSAID and splint use. 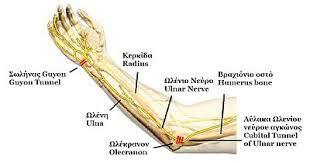 For cubital tunnel syndrome refer to Occupational Therapy (OT) for night elbow splints. If the patient exhibits no relief of pain, sensory changes, decreases in AROM or strength to the upper extremity within 3-4 weeks, refer to OT for evaluation and treatment. Chronic CTS or cubital tunnel syndrome with symptoms >6months can be referred to OT for evaluation and treatment. If the patient has completed a full course of treatment through OT and referred back to primary care with no improvement, referral to Orthopedic Surgery is indicated. Orthopedic Hand Clinic referral is indicated if a sensory (2 point discrimination >5mm) or motor deficit is demonstrated in patients with CTS. Chronic condition that can be managed at primary care level with intermittent specialty care evaluation/intervention as needed.